Brakes are in excellent condition come as u see them pads still good and even wear. Ciamillo Cam System OG-06 TI. Do your research very light weight great modulation very reasonable price. For Sale; 54 cm. color: ”Team HTC black/white/green”.. Frame: ”SWorks FACT IS 11R carbon”. Group: Campagnolo Record (Rear Derailleur Super Record) 11 speed. crank: 172.5mm 53/39. Specialized S Works seat post/ Specialized Toupe Pro Carbon saddle. Specialized Sworks Carbon 42cm / aluminum stem. 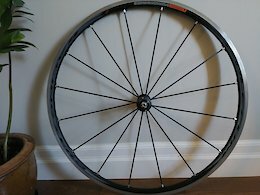 $2700 with Specialized Roval Fusee SL45 clincher wheels (as pictured) or could have other option Fulcrum Racing Zero wheelset with new tire as seen, $3450 in excellent condition. 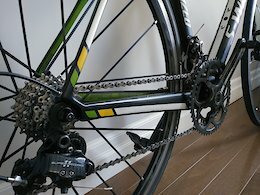 Excellent condition never been dropped comes with SRAM Red throughout 10sp 53/39 crank 11t-26 cassette - also bike has no dents or cracks never ridden in rain and well taken care of. Also Ksyrium ES Helium Anniversary Edition wheels tyres are new, also 40cm carbon bars. 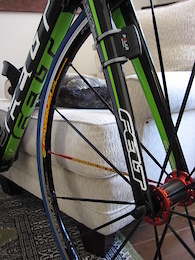 Felt has a sloped top tube so fits smaller in size no pedals/cage,polar with sale. Would add that I have another bike so very few kms as can be seen . 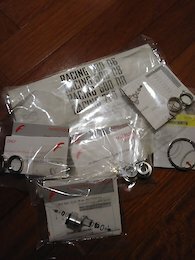 Please note shipping will be determined before final sale.Thx for looking also bike looks better in person.